Of all the animals that inhabit the worldís northern climates none has been subject to greater reverence than the bear. Indigenous societies of North America and Northern Eurasia share a seemingly uniform belief that this elusive creature is endowed with supernatural qualities. Ceremonies venerating slain bears were, until more recent times, an important aspect of the Sami belief system. Close examination of eyewitness accounts shows that this ritual is in many ways typical of other bear ceremonies in the northern hemisphere. In this essay I will explore possible explanations for the common occurrence of bear ceremonialism, and what this indicates about the Samiís relationship with other indigenous cultures. This subject has received a fair amount of scholarly attention, and a few anthropologists have actually theorized about the origin of the ritual. Based on their information I believe that we can logically infer three possible explanations for this cultural parallel. 2. Ancient Ancestral Belief-System – The bear’s position of prominence within the totemic dominance hierarchy, in each of these groups, is the result of a common ancestral belief-system of Asiatic origin dating back to the time of the Magdalenian period of 20,000 years ago. The Sami, the ancient Finns, the Tungus, the Gilyaks and various other tribes of Siberia, the Ainu of Japan, and Native North American groups, such as the Algonkins and Tlingit, all derived this belief (more or less intact) from the bear cult of prehistoric times. 3. Historical Interaction – Reverence is a common reaction for humans living in close contact with bears. However, many of the similarities in rites, rituals, and folklore are the result of cultural interactions. Other similarities are purely superficial and do not indicate a shared ancestral system. 1. Religious Level – The bear ceremony is a form of communication with the supernatural world, and is an expression of the belief in a hierarchy of spiritual entities. The bear is the representative of a high-ranking deity. 3. Psychological Level – In hunter-gatherer societies there is a certain amount of guilt associated with killing animals. The level of guilt may be greater when it is necessary to kill an animal that is seen as being more anthropomorphic or rare. The bear ceremony is performed in order to pacify the bear’s vengeful spirit. I will not claim that any one of these levels alone is the causal motivator. Nor will I assert that one of the three hypotheses on its own can sufficiently explain every aspect of this subject. However, in order to avoid a ìrelativist positionî, I will attempt to integrate all of these hypotheses, and levels of interpretation, into one satisfactory conclusion. The hunting and killing of such animals is certainly necessary, but at the same time it is frequently a dangerous matter, because in doing so the hunter naturally incurs the anger of the animal killed. 1. Departure for the forest. Bear hunting usually takes place during the hibernatory season, late winter or early spring. Once a den has been located the hunters are assembled, the Noajdde and his drum are consulted, and they then depart for the forest. The one who has located the bear takes the lead. He holds a staff with a brass ring attached to it. A Noajdde usually follows him and precedes the hunter elected to strike first. 2. The Hunt. The one who located the bear is sent into the den to awaken it. The Sami were known to have used firearms, bow and arrow, lances or spears, and even axes as a means of slaying the bear. The animal was not attacked directly if a spear was being used, the weapon was held in reverse until the beast began its attack and impaled itself. 4. The Bear Master returns. When the hunters return to the sijdda their wives greet them by spitting elder bark juice in their faces. The principal bear-killer brings the ring to his goahte, knocking three times at the door. If the bear is female he calls out s–ive neit (holy virgin), if the animal is male he shouts s–ive olmai (holy man) The bear master’s wife keeps the ring in a linen cloth until after the ceremonial meal. 5. The Feast. It was customary for the men to prepare and cook the bear meat in a specially erected goahte that no woman could enter. Women must cover their heads and during the next five days can only look at the bear killer through a brass ring. After this prescribed period of three days, the bear’s skin is stretched out in the center of the banquet area where various libations of tobacco and foodstuff are offered to its spirit. After an apologetic speech is given the feast of bear meat begins. 6. Ringing Him in. After the feast the ring is removed and the women and children attach pieces of a brass chain to it, which is then tied to the bears tail. Next, the ring is given to the men who bury it with the bones. Great care is taken to ensure that the bones are arranged in their original form. 7. Immunizing the women. Finally, the skin is laid out on a stump and the blindfolded wives of the bear slayers take turns shooting at it with arrows. This last feature is the most outstanding of the Sami ritual. Special care must be taken to guard women and children against the bear’s vengeful spirit. By shooting the carcass they conquer this fear. The bear plays a great part in the life of all the peoples inhabiting the region of the Amoor and Siberia as far as Kamtchatka, but among none of them is his importance greater than among the Gilyaks. 1. A cub is captured in the forest; its mother is killed if necessary. 2. The cub is brought back to the village, where it is confined in a cage until reaching maturity. During its time at the village the cub is treated like an honored guest, it is routinely walked, cleaned, and well fed. 3. An arena where the bear will die is prepared. It is then removed from its cage for the final time and is lead from hut to hut where it is teased with fir branches. At the same time reassuring words are spoken to it. The bear’s host sometimes sneaks up on it and kisses it good-bye. 4. The bear is led down to a river, around the host’s house three times, and then into the house. Everyone must leave the house except for the oldest kinsman. Finally, the bear is led to a place that has been prepared for it and tied down between two stakes. The animal is left alone for a moment while the banquet commences. 5. The host feeds the bear for the last time. ìFarewellî, he says to the bear, ìI feed you for the last time; go directly to your owner. May you be able to gain your master’s affection. 6. The procession of the executioner begins. The village headman walks in front, carrying a kettle and an axe, he is followed the Narch-en (shaman), holding the same, and then the rest of the guests. 7. The executioner waits for the bear to turn in such a way that an arrow can be sent straight to its heart, all the while he speaks to it reassuringly. 8. The bear’s corpse is laid out in the snow facing west. All of its skin is removed except for the head. The head and skin are laid out on a framework resembling a body. A quiver of arrows, tobacco, and eatables are laid beneath the head. 9. The meat is eaten on the day after the execution. A lively feast goes on through the night. 10. Two dogs are often sacrificed to the bear’s spirit on the day after the feast. The great winter festival is only an extension of the rite that is observed at the slaughter of every bear. Hunting, particularly bear hunting, required strict adherence to ritual. The bear itself is a deity and the Bear Ceremony is the best known of all Ainu rituals. 1. Hunters capture a bear cub from a den or shortly after emerging. 2. The bear is raised among the villagers for a year and a half inside a special hut. The women of the village sometimes nurse the cub. 3. The Iyomante festival is held at the beginning of the cold season, September or October. 4. Prayers are offered to Fuchi the fire goddess and to Kimun-Kamuy the god of the mountains. 5. The bear is lead out of the hut by a procession of prominent village men to the nusa (sending place). At this time the women begin addressing it with terms of endearment. 7. Male elders skin and dress the bear. The skin is left attached to the head. Afterwards they place the skin in front of an altar with gifts that may include food, sake, and a sword and quiver. She-bears are sometimes adorned with a necklace and earrings. 8. The meat of the bear is taken to back to the hut and left there till the next day. Its liver is cut into small pieces, salted, and then eaten. The men drink the blood that has been gathered in cups. While the bear is being disemboweled the women begin to cry and dance mournfully. 9. The meat is eaten the next day and the celebration continues. The parallels between the bear ceremonies of these three very distantly related cultures are unmistakable. In each case all three functional levels are simultaneously present. A consistent belief in the bear’s role as mediator between humanity and the lord of the forest reveals much about the rationale behind the ceremony. It was not the physical manifestation of the bear that controlled natural phenomena, such as reproduction; rather it was his or her archetypal ìownerî. In each of these examples the creature’s spirit is begged for forgiveness -the blame is often ascribed to a neighboring tribe- and offered gifts to take to its master. Many of the rites performed may appear paradoxical to the western mind. Why is it that they would kill an honored guest? Why tease and praise the bear at the same time? Why fear its wrath if you are paying homage? The motif that reoccurs most often is reciprocity with nature. The animal is expected to sacrifice its mortal self so it may return to the god with words of praise for its human counterparts. Still, there may be some uncertainty as to whether or not the animal wishes to leave. The bear’s spirit is not feared because of any inherent malignance, he may simply be angry for having been slain. This idea could indeed be the result of the respect, and guilt, experienced after taking the life of a formidable creature. Equally plausible explanations can be given in terms of religious beliefs, economics, or underlying psychology, but I find none of them alone to be adequate. Only by assuming the participant’ mind set can one hope to appreciate the ritual’s true meaning. The widespread dispersal of these notions, from S·pmi to the Hudson Bay, does suggest that its origins are indeed rooted in the bear cult of prehistory. A wall painting from the Trois-FrËres cave, which dates back to the Magdalenian period, clearly depicts an ancient bear ritual. The bear is shown being shot and stoned to death while blood streams from its mouth. Countless collections of Ursine bones and skulls have been found deposited across the Northern Hemisphere. Of course many of the similarities shared by the Gilyak and the Ainu ceremonies can no doubt be explained by the close contact between these two groups. But this should in no way negate the theory of its ancient origin. Nor should the fact that reverence for bears does seem to be a natural inclination for humans everywhere. There are remnants of this in western culture as well: the word berserk is of Norse origin meaning ìbear shirt,î the Welsh name Arthur is usually translated as ìbear hero,î and the Greek myth explaining the origin of Ursa Major and Ursa Minor is strikingly similar to some of the beliefs of the peoples discussed. The animal’s peculiar habit of hibernation certainly lends it an air of mystery. Bear remains are difficult to find because they usually crawl away to the mountains to die. Above all, the bear is a creature that lends itself easily to anthrophomorphication, its habit of standing on two legs to strike and the human-like appearance of its skinned carcass gave many cultures, including the Sami, a sense of kinship. Interesting, right? One of the main problems I have found for this projects is which criteria to use when chosing and limiting which communities to include or exclude on the trip. I think that religious practices may be a good one to use, as it provides a very interesting approach. Shaman rituals took on their own specific form of music and song. They were played during special gatherings for healing and augury when the Shaman came into contact with spirits. When a Shaman passes into a trance, his singing would move from exclamatory sounds, growls, wheezing, and different tonal modulations and rhythmic changes. 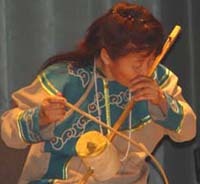 During the Shaman’s ritual, percussion instruments are often used, such as the Khas – a tambourine with rattles, as well as the Yampa – a girdle with metallic rattles. Apart from their musical role, these instruments have another function. 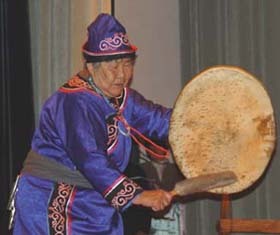 The buben is a combination of a tambourine and a drum made either out of the skin of reindeer or seals. It is the main instrument of the Shaman and is believed to hold secret powers. Indeed it is believed that the power that calls up the spirits is contained within it. The girdle symbolizes the intermediary earthly life, as part of their trinomial view of the world, a characteristic of the ancient peoples of Sakhalin. One of the girdle’s functions is to protect, as the Nivkhs believe that ringing sounds, noise and metallic bobs drive away the forces of evil. The bear ritual was a complex ritual, which lasted several days. This is the initiation of the main Nivkh totem, the bear, considered to be related to man. During the bear ritual the main instrument used was a percussive instrument, the Tyatya Chxach – Musical Log (a percussion instrument). It is played exclusively by women, who beat it with wooden poles. The pole symbolises the body of the bear. On one of its sides is carved the head of a bear. The instrument was considered sacred. The rhythm of the strokes depended on the rhythmical texts. The words were made up from ancient mythological texts, symbols, which are connected for the most part to the bear. The log dances were performed by the women dancing with fir twigs and wooden clacks – Korgosh – or with sacred bark from the Inau (a tree believed to have great healing powers). The dances of the women imitated the movements of the bear. These ritualistic dances were considered the climax of the Bear Ceremonies. During the playing of the instrument the wavering of the reed amplifies with the help of the performers mouth, which is the main resonator. The melodies played by the mouth organ do not differ very much in difficulty, but the attraction is in the beauty of the flowing ‘cosmic’ sound, which is rich in deep overtones. Tynryn – a peculiar Nivkh viola with round bow – belongs to the string instruments. The playing technique is unique. The instrument has three soundboards: a pannier made of birch tree bark the fingerboard and the performers mouth. While playing the performer lightly touches the open string with the tongue causing a tremolo. In the result of that an extra overtone line in appearing. Therefore one can play even two or thee voiced melody. Nivkh Folklore has always been carried from one generation to the next through an oral tradition. It has never been written down. This means that improvisation and variations of character make up the whole process of folklore creations. At first sight Nivkh melodies are not difficult in their formation. They are based on 3 to 4 musical degrees. At the same time if one listens carefully, one realises that they don’t stay unchanged but vary all the time. Each sound should be thought of as a living organism. In most cases the melody represents improvisations on a theme. I am not specialist enough on music to know if there are common elements between all the cultures around the Artic circle. Maybe common construction materials or techniques? That is a point I never had thought about, but it could be very interesting, as music in old communities is strong and important, sometimes closely linked to spirituality or shamanism as well as to celebrations and rituals. The weak antropologist on me should start kicking the linguist! As far as I know, and i know it is not too much, the Bear Celebration could be a common element in many of this cultures. At least was practised for Saami people, as well as Nivkhi. Throat singing is practised also in Alaska, maybe in other places too. As I take a break from writing an essay for AIDS, Power and Poverty, the last of the assignments I will ever write for my minor in International Development Studies, I can’t help but want to express to you something that has really convicted me. As many of you know, I am an active advocate for raising awareness and funds for HIV-related issues in Africa. However, I recently became convicted of my lack of personal knowledge about issues with HIV in Canada. While HIV rates are increasing on the whole within Canada, research led me to an interest in Canada’s First Nations populations, a sector of Canadian society that has already been ravaged by high suicide rates, unemployment rates, a lack of adequate housing, and alcoholism, to name only a few. Is this the Canada you know? To give you some data that I am currently using for my paper, Aboriginal groups make up approximately 3.3% of the total population of Canada, however, they represent 5-8 percent of people currently living with HIV in Canada (2,3). Furthermore, in 2002, aboriginal people comprised 6-12 percent of the new infections found in Canada (2). The Assembly of First Nations projects that infections in the aboriginal community actually represents 16% of new infections (1). Faced with these numbers one finds a dire situation occurring in the First Nations communities in Canada. But these are only numbers, and numbers are not completely accurate, so let us remember that there are people behind the statistics who feel and think and emote just like everyone else. Likewise, I am deeply concerned about our First Nations communities and so I am extending that concern to you, as awareness is the first step to taking serious action in the face of such devastation. That is the sole purpose of this entry – maybe you knew all this already, but if you did not, now you do. What you will do with that knowledge is up to you. (1) AFN. (n.d.). Fact Sheet: The Reality for First Nations in Canada. Retrieved February 28, 2007, from click here. (2) Health Canada. (2006). First Nations and Inuit Health: HIV and AIDS. Retrieved February 28, 2007, from click here. (3) PHAC. (2003). HIV/AIDS Among Aboriginal Persons in Canada: A Continuing Concern. Retrieved February 27,2007, from click here. (4) Canadian Red Cross. (November 28, 2006). Canadian Red Cross calls for awareness of HIV rates among First Nations. Retrieved February 28, 2007, from click here. Nunavut — “our land” in the Inuktitut language – has been home to Inuit for millennia and part of Canada for more than a century. Embracing both traditional knowledge and values and the new opportunities presented by technologies like the Internet, the Government of Nunavut now provides a wide range of services tailored to the unique needs of approximately 29,500 residents. Read about our people and culture, wildlife, official symbols, background about Nunavut Land Claim, and much more. Look up MLA contact information, read up on Acts and regulations, Throne Speech, Hansard, status of Bills and more. Nunavut is a place of great economic growth. Read the latest Requests for Proposals about the Inuit/Northern Preference and information about Starting a Business. 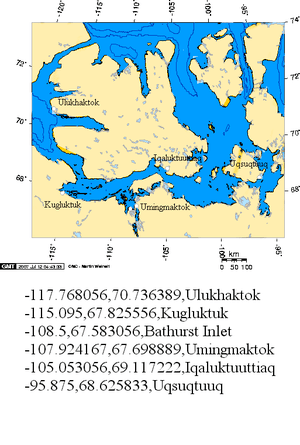 The site includes a map of Nunavut, a list of the communities, and some interesting fact sheets. Quite an interesting site! Though a bit more of information an maps would be interesting. I found my hero! I found a the website of Nicolas Varnier, a French guy who travels the North with a dog sledge! Wow! He has an interesting website, though it is in French. I am quite able to read it but too lazy to translate it… Anyway you can take a look at it if you want. Wannabe that guy! – Loup (un film produit par MC4 et distribué par Pathé. Tournage 6 semaines en 2008, sortie sortie la fin de 2009) Nicolas voue une véritable fascination à cet animal dont il a croisé la route plusieurs centaines de fois. Il a toujours rêvé de lui consacré un grand film. L’histoire de ce film est né de la rencontre que Nicolas avait faite avec une famille de nomades éleveurs de rennes au cours de sa longue traversée de la Sibérie en 1990. Pendant près d’un an, Nicolas vivant comme l’un des leurs avait partagé la vie de ces nomades et de leur grande harde, se déplaçant avec eux d’un alpage à un autre, à dos de rennes ou juché sur un traîneau. Il avait alors constaté le lien très fort qui unissait ces hommes au territoire sur lequel il vivait en parfaite harmonie. Territoire qu’ils se partageaient avec les loups qu’ils haïssaient et vénéraient en même temps. – Le Dernier Trappeur (Long métrage de fiction – Décembre 2004): Norman Winther est l’un des derniers trappeurs à entretenir avec les majestueuses Montagnes Rocheuses une relation d’échanges fondée sur une profonde connaissance du milieu et un grand respect des équilibres naturels. Avec sa femme, Nebaska, une indienne Nahanni, et ses fidèles chiens de traîneau, Norman nous emmène à la découverte d’un autre monde rythmé par les saisons. Randonnées dans la froidure de l’hiver, descentes de rivières tumultueuses, attaques de grizzly et de loups sont le quotidien du trappeur. Norman cultive sa vie comme un art de vivre dans ce monde où les blizzards soufflent parfois plus fort que les mots. Ce film est un hymne aux pays d’en haut et à la magnificence de ces vastes espaces sauvages. Breathtaking! I like to see that there are still adventurers today! Another frozen new from The Independent. It is not strictly related with the topics of the blog, but it is quite interesting anyway. And is related with the global warming issue, which truly affects indigenous arctic peoples… and non-arctic! A German geography professor has developed a controversial system of mountain “wind-catching” screens which he claims could slow or even halt the dramatic rate at which Europe’s glaciers are melting. Glaciers across the globe are shrinking fast as a consequence of global warming. In Europe alone, some researchers have predicted that all its glaciers will have vanished by 2100. However, Professor Hans-Joachim Fuchs from Germany’s Mainz University claims to have found at least a partial answer to the problem. His technique involves capturing the power of cold mountain – so-called kabatic – air streams with wind-catching screens installed on melting glaciers. The screens are designed to harness the dense kabatic air streams which flow downhill and deflect them directly on to the surface of the glaciers, thereby cooling them enough, it is hoped, to counteract the effects of global warming. In early August, Professor Fuchs and a team of 27 student researchers from Mainz university travelled to the Rhône glacier in Switzerland. There they installed a 15 metre-long, 10 metre-high wind catching screen at an altitude of 2,280 metres on the glacier in the country’s Valais region. Monitoring has shown that the Rhône glacier is shrinking seven metres a year. However, Professor Fuchs insists that his wind- catcher will help to combat this. “We hope that our installations will bring about a net cooling of the area,” he said in a statement. “If the meltdown is not stopped, we hope that it will at least be slowed down,” he added. We have several research groups investigating a range of issues in both the environmental sciences and social sciences of relevance to the Arctic and Antarctica. Our polar library, which includes the Shackleton Memorial Library, has comprehensive holdings of scholarly books and journals on polar research, with exceptional archival collections from the exploration of the Antarctic and Arctic. We also have extensive online resources, including bibliographic and other information. Around 60 academic, library and support staff, together with postgraduate students, associates and fellows attached to our research programmes, are working in the Institute, providing a strong core of intellectual activity focused on the Arctic and Antarctic and their adjacent seas. We offer two Graduate Degree courses; a one-year Master’s Degree (M.Phil.) course in Polar Studies, and a three-year Doctoral Degree course, leading to a Ph.D. degree. Both courses are closely tied to the research activities of the Institute. – Glaciology and Climate Change Group. – Polar Landscape and Remote Sensing Group. – Polar Social Science and Humanities Group. – Circumpolar History and Public Policy Research Group (HiPP). In addition, the Institute is part of the NERC Centre for Polar Observation and Modelling. – Academic staff: Dr Michael Bravo, Dr Piers Vitebsky. – Institute Associates: Prof Valerie Alia:(indigenous and northern media; media representations of polar peoples; Inuit naming; names, identities, politics and power; media ethics; research ethics), Keith Hill (transport, telecommunications and economic development in the Russian Far East; 18th century German scientists in Siberia), Dr Florian Stammler, Dr John Tichotsky (Regional economic development in Siberia, Alaska, Mongolia and China), Dr Emma Wilson. – Elizabeth Beiswenger: indigenous political representation and self-government in the Chukotka Autonomous Region. – Janne Flora: suicide and personhood in Greenland. – Stephanie Irlbacher Fox: the development of political institutions in the Canadian North. – Traplines and Tar Sands: an Ethnographic Analysis of Intersecting Economies in a Subarctic Indigenous Community. – Richard Powell: field practices and environmental science in the Canadian Arctic, 1950-2000. – Hugo Reinert: political epistemology of reindeer herding in the Norwegian Arctic. – Elena Khlynovskaya Rockhill: the institutionalisation of children in Magadan. – Steven Sawhill: environmental diplomacy in the Barents Region; the decentralisation of foreign affairs. – Olga Ulturgasheva: narrative and concepts of memory among the Eveny of northern Sakha (Yakutia). Movements: A Comparative Study of Nunavut, Canada and Tuva, Russian Federation. It is a pity they do not have RSS to follow them. I will have to come back to the old method: memory!